Juniper is the common name for any of various evergreen, coniferous trees or shrubs comprising the genus Juniperus of the cypress family Cupressaceae, characterized by needle-like and/or scale-like leaves and the female cones having a small, round, fleshy, berry-like structure with hard-shelled seeds. Depending on the taxonomic scheme, there are between 50 and 67 species of juniper, widely distributed throughout the northern hemisphere, from the Arctic, south to tropical Africa in the Old World, and to the mountains of Central America in the New World. Juniper "berries," the fleshy female cones, which are commonly blue or bluish-gray in color, but may be red-brown or orange, are used as a spice in a wide variety of culinary dishes and best known as the primary flavoring in gin. Juniper berry sauce is often a popular flavoring choice for quail, pheasant, veal, rabbit, venison, and other meat dishes. The volatile oil in juniper berries also has traditional been used in herbal medicine, a function for which they continue to be popular today. In addition, the trees are grown for ornamental purposes, and the wood of some junipers, such as the insect-resistant, close-grained wood of the confusingly named eastern red cedar (Juniperus virginiana), is used in construction. Juniper berries and seeds are eaten by a wide variety of birds and mammals, including raccoons, gray foxes, coyotes, rabbits, and deer. In turn, wildlife helps to disperse the seeds, which normally do not fall far from the tree. 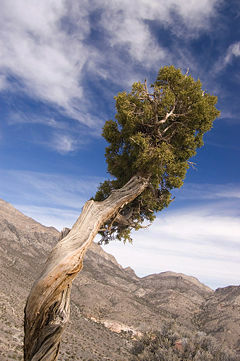 Thus, species of junipers provide a larger function of benefit to the ecosystem (and humans) and in turn their individual function of survival and reproduction as a species is advanced. Juniperus occidentalis var. australis, eastern Sierra Nevada, Rock Creek Canyon, California. As conifers, division Pinophyta, junipers are cone-bearing seed plants (specifically gymnosperms) with vascular tissue. Junipers vary in size and shape from tall trees, 20 to 40 meters (66-131 feet) tall, to columnar or low spreading shrubs with long trailing branches. They are evergreen with needle-like and/or scale-like leaves. They can be either monoecious or dioecious. The female seed cones are very distinctive, with fleshy, fruit-like, coalescing scales that fuse together to form a "berry"-like structure, 4 to 28 millimeters (0.16-1.1 inches) long, with 1 to 12 unwinged, hard-shelled seeds. In some species these "berries" are red-brown or orange but in most they are blue; they are often aromatic. The seed maturation time varies between species from 6 to 18 months after pollination. The male cones are similar to those of other Cupressaceae, with 6-20 scales; most shed their pollen in early spring, but some species pollinate in the autumn. Juniper needles, magnified. Left, Juniperus communis (Juniperus sect. Juniperus; note needles "jointed" at base). Right, Juniperus chinensis (Juniperus sect. Sabina; note needles merging smoothly with the stem, not jointed at base). Many junipers (for example, J. chinensis, J. virginiana) have two types of leaves: Seedlings and some twigs of older trees have long, needle-like leaves 5 to 25 millimeters (0.2-1 inches) long; and the leaves on mature plants are (mostly) tiny, 2 to 4 millimeters (0.08-0.16 inches) long, overlapping, flat, and scale-like. When juvenile foliage occurs on mature plants, it is most often found on shaded shoots, with adult foliage in full sunlight. Leaves on fast-growing "whip" shoots are often intermediate between juvenile and adult. In some species (for example, J. communis, J. squamata), all the foliage is of the juvenile needle-like type, with no scale leaves. In some of these (for example, J. communis), the needles are jointed at the base, in others (such as J. squamata), the needles merge smoothly with the stem, not jointed. The needle-leaves of junipers are hard and sharp, making the juvenile foliage very prickly to handle. This can be a valuable identification feature in seedlings, as the otherwise very similar juvenile foliage of cypresses (Cupressus, Chamaecyparis) and other related genera is soft and not prickly. Juniper is the exclusive food plant of the larvae of some Lepidoptera species, including Bucculatrix inusitata and Juniper Carpet and is also eaten by the larvae of other Lepidoptera species such as Chionodes electella, Chionodes viduella, juniper pug (Eupithecia pusillata), and pine beauty (Panolis flammea). Juniper berries, here still attached to a branch, are actually modified conifer cones. A juniper berry is the female seed cone produced by the various species of junipers. It is not a true berry but a cone with unusually fleshy and merged scales, which give it a berry-like appearance. The cones from a handful of species, especially Juniperus communis, are used as a spice, particularly in European cuisine, and also give gin its distinguishing flavor. 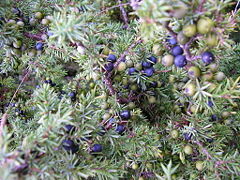 All juniper species grow berries, but some are considered too bitter to eat. In addition to J. communis, other edible species include Juniperus drupacea (Farjon 2005), Juniperus oxycedrus (Adams 2004), Juniperus phoenicea (Dalby 2002), Juniperus deppeana, and Juniperus californica (Peattie and Landacre 1991). Some species, for example Juniperus sabina, are toxic and consumption is inadvisable (Grieve 1984). Juniperus communis berries vary from four to twelve millimeters in diameter; other species are mostly similar in size, though some are larger, notably J. drupacea (20–28 mm). Unlike the separated and woody scales of a typical pine cone, those in a juniper berry remain fleshy and merge into a unified covering surrounding the seeds. The berries are green when young, and mature to a typically purple-black color over about 18 months in most species, including J. communis (shorter, 8–10 months in a few species, and about 24 months in J. drupacea) (farjon 2005). The mature, dark berries are usually but not exclusively used in cuisine, while gin is flavored with fully grown but immature green berries. Mature purple and younger green juniper berries can be seen growing alongside one another on the same plant. Juniper berries are used for culinary and medicinal purposes, and the tree itself is used for lumber and aesthetic purposes. Juniper has had a long traditional use. Many of the earliest prehistoric people lived in or near juniper forests, which furnished them food, fuel, and wood for shelter or utensils, and juniper berries were used medicinally by the Ancient Egyptian doctors, the Ancient Greeks, and by Native Americas (Wurges 2005). In addition to medical and culinary purposes, Native Americans have also used the seeds inside juniper berries as beads for jewelery and decoration (Moerman 1998). The Romans used juniper berries as a cheap domestically-produced substitute for the expensive black pepper and long pepper imported from India (Dalby 1997). Juniper berries have been used as a popular flavoring agent for gin for more than 300 years (Wurges 2005). Note, however, that the compilation of poisonous plants by Filmer (2010) of the University of California Davis (2010) lists Junipersus spp. as mildly toxic, a category that includes plants whose ingestion may cause vomiting, diarrhea, or other minor illness. The cones from a handful of juniiper species, especially Juniperus communis, are used as a spice, particularly in European cuisine, and also give gin its distinguishing flavor. According to one FAO document, juniper berries are the only spice derived from conifers (Ciesla 1998), though tar and inner bark (used as a sweetener by Apache cuisines) from pine trees is sometimes considered a spice as well. Gin was developed in the seventeenth century in the Netherlands. It was first intended as a medication; juniper berries are a diuretic and were also thought to be an appetite stimulant and a remedy for rheumatism and arthritis. The name gin itself is derived from either the French genièvre or the Dutch jenever, which both mean "juniper" (Ciesla 1998). Other juniper-flavored beverages include the Finnish rye-and-juniper beer known as sahti, which is flavored with both juniper berries and branches (Jackson 1995). Juniper berries are used in northern European and particularly Scandinavian cuisine to "impart a sharp, clear flavor" (Ciesla 1998) to meat dishes, especially wild birds (including thrush, blackbird, and woodcock) and game meats (including boar and venison) (Montagne 2003). They also season pork, cabbage, and sauerkraut dishes. Traditional recipes for choucroute garnie, an Alsatian dish of sauerkraut and meats, universally include juniper berries (Steingarten 1997). 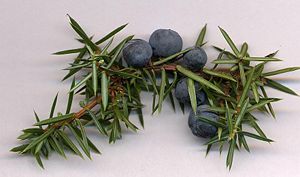 Besides Norwegian and Swedish dishes, juniper berries are also sometimes used in German, Austrian, Czech, and Hungarian cuisine, often with roasts. A few North American juniper species produce a seed cone with a sweeter, less resinous flavor than those typically used as a spice. For example, one field guide describes the flesh of the berries of Juniperus californica as "dry, mealy, and fibrous but sweet and without resin cells" (Peattie and Landacre 1991). Such species have been used not just as a seasoning but as a nutritive food by some Native Americans (Moerman 1998). Juniper is held to have diuretic, antiseptic, antimicrobial, anti-inflammatory, anti-rheumatic, and stomachic properties, which are traced to a volatile oil found in the berries (Wurges 2005). This oil has terpenes, flavonoid glycosides, sugar, tannins, tar, and resin, with terpinen-4-ol, a diuretic compound, held to stimulate the kidneys and the flavonoid amentoflavone held to have antiviral properties (Wurges 2005). The resins and tars are believed to benefit skin conditions such as psoriasis and the desoxypodophyllotoxins may help to inhibit the herpes simplex virus (Wurges 2005). Modern herbalists also used juniper to treat bladder infections, chronic arthritis, gout, fluid retention, kidney disease, menstrual irregularities, heartburn, and dyspepsia (indigestion), among other ailments (Wurges 2005). Juniper is a powerful [[diuretic], which makes it useful for urinary and bladder infections; it may be more effective in combination with other herbs (Wurges 2005). Juniper's anti-inflammatory properties make it used to relieve pain and inflammation from arthritis, gout, and rheumatism. Juniper berries have long been used as medicine by many cultures. Doctors in ancient Egypt used the volatile oil as a laxative as far back as 1550 B.C.E. (Wurges 2005). Juniper berries have been found in ancient Egyptian tombs, including Juniperus phoenicia and Juniperus oxycedrus at multiple sites. The latter is not known to grow in Egypt, and neither is Juniperus excelsa, which was found along with J. oxycedrus in the tomb of Tutankhamun (1341 B.C.E.–1323 B.C.E.) (Manniche 1999). The berries imported into Egypt may have come from Greece; the Greeks record using juniper berries as a medicine long before mentioning their use in food (Dalby 1997). The Greeks used the berries in many of their Olympics events because of their belief that the berries increased physical stamina in athletes (Lorman 1997). In the Americas, the Zuni Native Americans used berries to assist them in childbirth, while other Native Americans used juniper berries and leaves to treat infections, arthritis, and wounds (Wurges 2005). Juniper berries act as a strong urinary tract disinfectant if consumed, as traditionally used by American Indians. Western tribes combined the berries of Juniperus communis with Berberis root bark in a herbal tea to treat diabetes. Clinical studies have verified the effectiveness of this treatment in insulin-dependent diabetes. Compounds in these plants when combined and ingested have been shown to trigger insulin production in the body's fat cells, as well as stabilize blood sugar levels. Native Americans also used juniper berries as a female contraceptive (Tilford 1997). Juniper has been used by British herbalists to promote menstruation and by nineteenth-century American herbalists as a remedy for congestive heart failure, urinary tract infections, and gonorrhea (Wurges 2005). The berries also have been used as a traditional remedy for cancer, arthritis, rheumatism, bronchitis, tuberculosis, and gout, and doctors often chewed juniper berries when treating patients to prevent infection (Wurges 2005). The seventeenth century herbalist physician Nicholas Culpeper recommended the ripened berries for conditions such as asthma and sciatica, as well as to speed childbirth (Culpeper 1990). Many species, such as J. chinensis (Chinese Juniper) from eastern Asia, are extensively used in landscaping and horticulture, and as one of the most popular species for use in bonsai. It is also a symbol of longevity, strength, athleticism, and fertility. Some junipers are susceptible to Gymnosporangium rust disease, and can be a serious problem for those people growing apple trees, the alternate host of the disease. The number of juniper species is in dispute, with two recent studies giving very different totals, Farjon (2001) accepting 52 species, and Adams (2004) accepting 67 species. The junipers are divided into several sections, though (particularly among the scale-leaved species) which species belong to which sections is still far from clear, with research still on-going. The section Juniperus is a monophyletic group though. Juniperus sect. Juniperus: Needle-leaf junipers. The adult leaves are needle-like, in whorls of three, and jointed at the base (see below right). Juniperus sect. Juniperus subsect. Juniperus: Cones with 3 separate seeds; needles with one stomatal band. Juniperus sect. Juniperus subsect. Oxycedrus: Cones with 3 separate seeds; needles with two stomatal bands. Juniperus sect. Juniperus subsect. Caryocedrus: Cones with 3 seeds fused together; needles with two stomatal bands. An Eastern juniper in October laden with ripe cones. Juniperus sect. Sabina: Scale-leaf junipers. 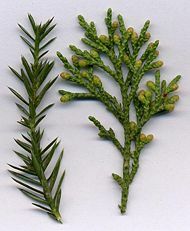 The adult leaves are mostly scale-like, similar to those of Cupressus species, in opposite pairs or whorls of three, and the juvenile needle-like leaves are not jointed at the base (including in the few that have only needle-like leaves; see below right). Provisionally, all the other junipers are included here, though they form a paraphyletic group. Adams, R. P. 2004. Junipers of the World: The Genus Juniperus. Victoria: Trafford. ISBN 141204250X. Ciesla, W. M. 1998. http://www.fao.org/docrep/X0453E/X0453e12.htm Chapter 8: Seeds, fruits, and cones.] In W. M. Ciesal and FAO, Non-wood Forest Products From Conifers. Rome: Food and Agriculture Organization of the United Nations. ISBN 9251042128. Retrieved November 20, 2008. Culpeper, N., and N. Culpeper. 1990. Culpeper's Complete Herbal & English Physician, Enlarged. Glenwood, Ill: Myerbooks. ISBN 0916638383. Dalby, A. 2002. Dangerous Tastes: The Story of Spices. University of California Press. ISBN 0520236742. Dalby, A. 1997. Siren Feasts: A History of Food and Gastronomy in Greece. Routledge. ISBN 0415156572. Farjon, A. 2001. World Checklist and Bibliography of Conifers. Richmond, Surrey, UK : Royal Botanic Gardens, Kew. ISBN 1842460250. Farjon, A. 2005. Monograph of Cupressaceae and Sciadopitys. Richmond, Surrey, UK : Royal Botanic Gardens, Kew. ISBN 1842460684. Filmer, A. K. 2010. Toxic plants. College of Agricultural and Environmental Sciences, University of California, Davis. Retrieved January 18, 2010. Grieve, M. 1984. A Modern Herbal. Penguin. ISBN 0140464409. Jackson, M. 1995. Sweating up a suitable thirst. Michael Jackson's Beer Hunter. Retrieved November 20, 2008. Manniche, L. 1999. Sacred Luxuries: Fragrance, Aromatherapy, and Cosmetics in Ancient Egypt. Cornell University Press. ISBN 0801437202. Moerman, D. E. 1998. Native American Ethnobotany. Timber Press. ISBN 0881924539. Montagne, P. 2003. The Concise Larousse Gastronomique: The World's Greatest Cookery Encyclopedia. London: Hamlyn. ISBN 0600608638. Peattie, D., and P. H. Landacre. 1991. A Natural History of Western Trees. Houghton Mifflin. ISBN 0395581753. Steingarten, J. 1997. True Choucroute. In The Man Who Ate Everything. Vintage Books. ISBN 0375702024. Tilford, G. L. 1997. Edible and Medicinal Plants of the West. Missoula, Mont: Mountain Press Pub. ISBN 0878423591. Wurges, J. 2005. Juniper. In J. L. Longe, The Gale Encyclopedia of Alternative Medicine, Farmington Hills, Mich: Thomson/Gale. ISBN 0787693960. All links retrieved June 15, 2018. This page was last modified on 15 June 2018, at 16:04.